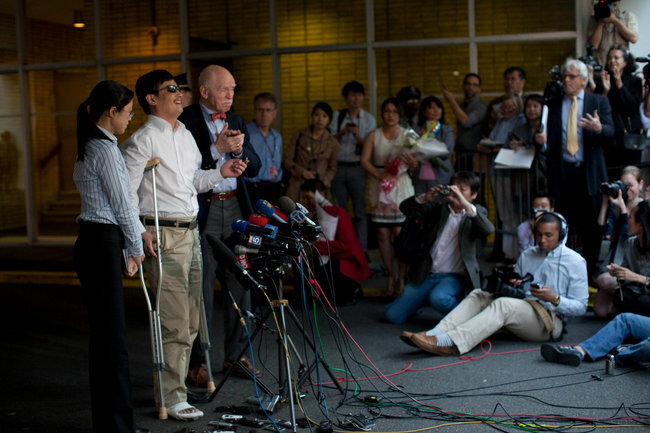 For seven years Chen Guangcheng has been silenced in China for his role in opposing illegal forced abortions in Shandong province, that ended today with his arrival in the US. Even after his escape from thugs in Linyi, the gov’t in Beijing kept him in a tightly guarded hospital room. Finally, he will have a chance to talk openly about his experiences and the situation facing hundreds of other activists in China. I hope you will take a moment to reflect on the power of that image – a man once tortured and imprisoned, now is able to stand in front of the world. I wanted to say that he was no longer afraid of the Chinese gov’t and their reprisals, but much of Chen’s extended family are still facing harassment from officials in Linyi. Even 10,000 miles away from Beijing, he is reminded that “opportunities and risk exist at the same time,” and is not yet truly free from the authorities. By T in Uncategorized on May 20, 2012 . I recall a comment made by a Chinese government spokesman that essentially stated, when asked about whether Chen could return home, that provided Chen complied with Chinese laws, he would be fine. My reaction vacillated between peals of ironic laughter and sadness that it was because he was trying to work within the framework of the existing laws that finds him in this position today.